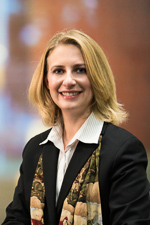 Dr. Kauffman received undergraduate degrees in computer information systems and business administration, her MBA from Rensselaer Polytechnic Institute, and her PharmD from The State University of New York at Buffalo. She is a member of the American Society of Health-System Pharmacists (ASHP) and Healthcare Information and Management Systems Society (HIMSS). She has the Apexus Advanced 340B Certificate and completed certification in clinical applications of pharmacogenomics at the University of Florida. Dr. Kauffman’s primary area of focus is pharmacogenomics and the ways in which appropriate laboratory testing can positively influence therapeutic drug monitoring (TDM). Other research interests include population health, opioid and antibiotic stewardship, and the effect of lab/pharmacy collaboration on service line workflows.